Christine Sutherland started her career in multi media in 1970 working on a documentary crew for the West Kooteany Ecological Study with Selkirk College. She continued with the Nelson School District developing “Learning Packages” for the area, until going to Massage School in Toronto in 1974. Her production company Sutherland Massage Productions has produced an educational series of how-to videos and DVDs on massage topics ranging from People to Pets. Christine studied at the Gulf Island of Film and Television School in 2000, the Vancouver Film School in 2001 and the Langara Film Program in 2005. Her mentor in Canadian documentary is Nettie Wilde and Bill Heath. In the 2007 International Digital Film Program with Selkirk College, Christine produced her documentary Rimpoche Rub as part of her “Mountain Massage” Film Project for submission to the Banff Mountain Film 2008 Competition. Along with film production, Christine is a Licensed Massage Therapist and Massage Instructor. She is the co-founder of the Sutherland Chan School and Teaching Clinic in Toronto, Ontario, and the Director of the Canadian Institute of Palliative Massage. 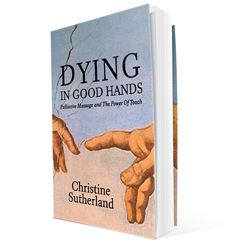 Christine is a keynote speaker with the BC Hospice Palliative Care Association.